One of the best pieces of advice we can offer to gem buyers is a maxim that we follow every day in our own business: buy it while you can. You never know when you may find it again. The only thing you can count on is that the price will be higher later, if you can find it at all. If you're a diamond buyer, this probably seems like odd advice. That's because diamonds are widely available in standardized cuts, grades and sizes. Colored gems, especially in the finer grades, are quite a different story. About 130 million carats of gem quality diamonds are mined each year in large scale mining operations, mainly in southern Africa, Canada, Australia and Russia. 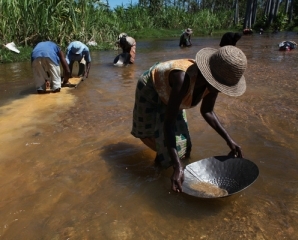 Colored stones, on the other hand, are mainly mined by independent miners working in a host of far-flung locations, from Sri Lanka and Burma to Madagascar, Tanzania, Zambia, Afghanistan, Colombia and Bolivia. Colored stone mining is mostly carried out with pick and shovel, and only rarely with mechanized equipment. Colored gems reach the market through channels that usually involve small deals between independent traders. The reality of the colored gems business becomes obvious when you go out in search of specific gems. If you look for a fine sapphire in a specific size, color and shape, you have to be very lucky to find exactly the gem you're searching for. The supply of fine sapphire is so variable that not every color, size and clarity grade will be available at any given time. The lack of supply is just a testament to the rarity of these gems, and the supply problem is now exacerbated by rising demand from emerging markets like China. Though the shortage of fine gems can be frustrating, the gem business can be exciting when interesting new stones come on the market. Many of the finest gems in our collection were acquired when we were early buyers of material from a new deposit. That is why we still have outstanding examples of Nigerian spessartite and Mahenge spinel in our inventory. Though the deposits of those gems are now exhausted, we bought rough stone when it was still available, knowing that this was a wise investment for the future. Sometimes we are lucky to buy fine material that was mined years ago. It happened last year with some beautiful gem silica from the Inspiration Mine in Arizona. Due to copper mining practices at the mine, no gem silica has been extracted in more than 20 years. We jumped at the rare opportunity to acquire some rough material that had been stored for many years. There's a story behind nearly every gem in our collection, but every story tends to repeat the same theme -- when the opportunity arises to buy a buy a really fine gem at a fair price, you have to take it. Gem dealers -- and gem collectors too -- have to be opportunists. This month we feature fine gems from our collection that nicely illustrate the maxim of buy it while you can ... these are gems that we cannot replace when sold. A gorgeous pink-red spinel from the Mahenge region of Tanzania. These rare spinels have a neon-like glow that is unique in the gem world. 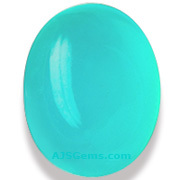 Excellent color saturation and perfect size for an impressive ring or pendant. 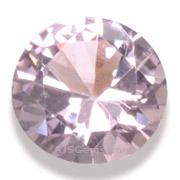 Certified as natural and unheated by GemResearch Swisslab (GRS) with the color noted as "pinkish-red" and origin "Tanzania". The finest Gem Silica comes from the Inspiration mine in Arizona. The best of this material is a vivid turquoise with very good translucency. This 8.55 ct pear is a good example of top grade material. 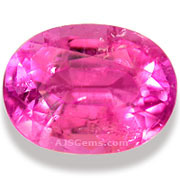 Taafeite is extremely rare and most of the early finds were misidentified as spinel, a gem it closely resembles. Taaffeite is a beryllium magnesium aluminum oxide but, unlike spinel, is doubly refractive. Thus far taaffeite has only been found in Sri Lanka. 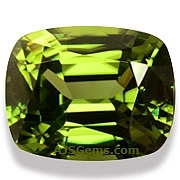 Green zircon are exceptionally rare. They form as the result of natural radiation in a process known as metamictization. Over long periods of geological time, radiation produces changes in the crystal lattice so that these metamict zironcs are amorphous rather than crystalline, while still maintaining the characteristic zircon fire. These rare specimens are coveted by collectors. 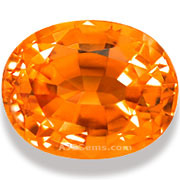 A Fiery Mandarin Garnet. This is a Beautiful Bright Stone that just glows Like a Burning Ember. Skilled Cutting Brings Out Both the Color and Luster of this Fine Garnet. 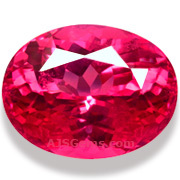 Gem Spessartite Garnets are Becoming Harder to Find, and a Gem of this Quality is Especially Rare...All AJS Gemstones are 100% Natural and Guaranteed. Pezzottaite is a new gem mineral that was just recently discovered (in 2002), but the original deposit yielded only a few dozen kilograms of rough material and was quickly exhausted. Pezzottaite is a lithium-rich member of the beryl group, with a hardness of 8. We still have a small number of pieces from the original deposit. We're exhibiting at the Pueblo Gem & Mineral Show in Tuscon from January 31 to February 12. The show is at the Arizona Riverpark Inn and you'll find us in room # 148. We're showing both rough and cut gems at the show. Look forward to seeing you there! Blue diamonds are among the rarest of all colored diamonds, and the famous Cullinan mine in South AFrica is the source of most of the important blues. The latest find is a 29.6 ct, described by the mine owner, Petra Diamonds, as displaying an "outstanding vivid blue with extraordinary saturation, tone, and clarity, and has the potential to yield a polished stone of great value and importance." In 2008, a 26.6 ct. rough blue diamond found at the Cullinan became the 7 ct. Star of Josephine, which sold for more than $9 million at Sotheby’s. Thailand was at one time a major mining center for ruby and sapphire, especially in the southeastern provinces of Trat and Chanthaburi. An important sapphire deposit was also discovered in Kanchanburi, to the west of Bangkok. Mining in Thailand reached its peak in the 1970's and the mines are now mostly worked out. Today Thailand is one of the leading cutting and trading centers for colored gems from all over the world.